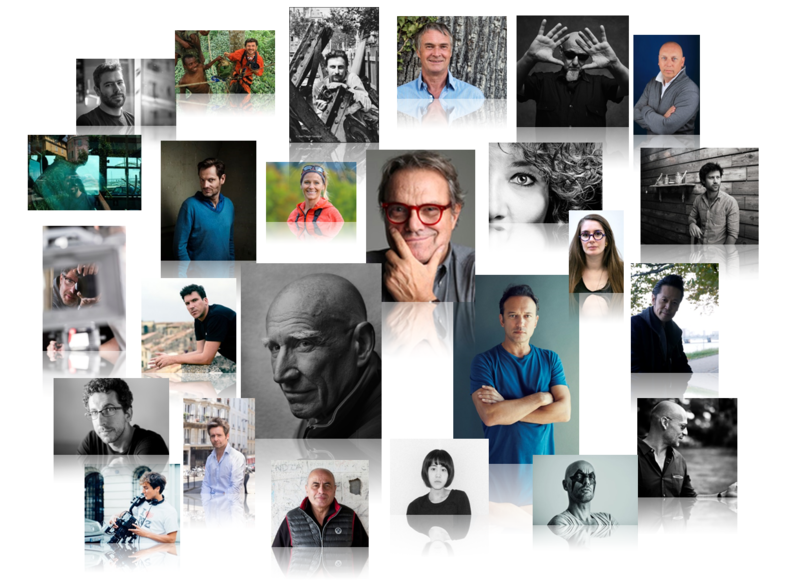 DEPUIS 10 ANS, LE SALON DE LA PHOTO INVITE LE PUBLIC À RENCONTRER DES GRANDS NOMS DE LA PHOTOGRAPHIE CONTEMPORAINE DE TOUS UNIVERS, À DÉCOUVRIR LEUR TRAVAIL ET LEUR PROCESSUS DE CRÉATION, À ÉCHANGER. Alain KELER . Alexis PICHOT . Antoine LE GRAND. Arnaud BAUMANN . Axelle DE RUSSÉ . Bernard DESCAMPS . Bernard PLOSSU . Bertrand DESPREZ. Bettina RHEIMS . Blanca LI . Bruno BARBEY .Catherine HENRIETTE . Cédric DELSAUX . Cédric KLAPISCH . Charles AZNAVOUR . Christian CHAMOURAT . Christine et Michel DENIS-HUOT . Christine SPENGLER . Claude NORI . Claudine DOURY . Corinne MERCADIER . Denis DAILLEUX . Denis DARZACQ . Denis ROUVRE . Diane TELL. Dominique ISSERMANN . Émeric LHUISSET . Eric BOUVET . Eric TRAORÉ . Florence NOTTE . Florent DEMARCHEZ . Floriane DE LASSÉ . Francis GIACOBETTI . François DARMIGNY . Françoise HUGUIER . Frank HORVAT . Frédéric LECLOUX . Georges ROUSSE . Gérard RANCINAN . Gérard RONDEAU . Gérard VANDYSTADT . Gianni BERENGO GARDIN . Gilles OUAKI . Giovanni GASTEL . Goksin SIPAIOGLU . Guillaume HERBAUT . Guy LE QUERREC . Hady SY . Hans SILVESTER . Iris BROSCH . Jane Evelyn ATWOOD . Jean MARQUIS . Jean-Christophe BÉCHET . Jean-Louis BLOCHLAINÉ. Jean-Marie PÉRIER . Jean-Paul GOUDE . Jean-Yves LEMOIGNE . Jérôme SESSINI . Joan BARDELETTI . JR . Juls BOO . Karl LAGERFELD . Kimiko YOSHIDA . Kyriakos KAZIRAS .Laurence GUÉNOUN . Laurent BALLESTA . Laurent KRONENTAL . Laurent MILLET . Laurent MONLAÜ . Leïla ALAOUI . LENAKA . Léo DELAFONTAINE . Lizzie SADIN . Lola REBOUD . Loustal. Luc CHOQUER . Lucie & Simon . Lucien CLERGUE . Marc RIBOUD . Marie-Laure DE DECKER .Marie-Paule NÈGRE . Mathilde DE L’ECOTAIS . Matthieu BERNARD-REYMOND . Michel BRAS .Michel SETBOUN . Micheline PELLETIER . Miquel DEWEVER-PLANA . Mohamed BOUROUISSA. Nicola LO CALZO . Nicolas GUÉRIN . Nicolas HENRY . Nicolas RIVALS . Noël QUIDU . Olivier JOBARD . Olivier LABAN-MATTEI . Orlan . Paolo VERZONE . Pascal MAITRE . Pascal ROSTAIN et Bruno MOURON . Patrick CHAUVEL . Patrick ROUGEREAU . Patrick TOURNEBOEUF . Patrick ZACHMANN . Peter KNAPP . Philippe GUÉGUEN . Pierre DE VALLOMBREUSE . Pierre GONNORD. Pierre TERRASSON . Pierre-Anthony ALLARD . Quentin BERTOUX . Ralph GIBSON . Raymond CAUCHETIER . Raymond DEPARDON . Renaud COULOUER . Reza . Roland & Sabrina MICHAUX. Romain LAURENT . Sabine WEISS . Sacha VAN DORSSEN . Samuel BOLLENDORFF . SarahMOON . Scarlett COTEN . Sebastiao SALGADO . Stanislas GUIGUI . Stanley GREENE . Stéphane COUTURIER . Stéphane LAVOUÉ . Steve HIETT . Thomas DEVAUX . Valérie JOUVE . Vee SPEERS . Véronique DE VIGUERIE . Victor COUCOSH . Vincent MUNIER . Vincent PEREZ . Vyaba Léon OUEDRAOGO . William DANIELS . William KLEIN . Xavier DESMIER . Xavier LAMBOURS . Xavier ZIMBARDO . Yan MORVAN . Yann ARTHUS-BERTRAND . Yves MARCHAND & Romain MEFFRE.